Apple to test “5G” in Cupertino & Milpitas, CA, but which RAN/Modulation Scheme? It’s hardly a surprise that Apple would be pursuing a path to 5G. The promise of this next generation of wireless is that smartphone makers might eventually achieve blistering wireless data speeds of 1 gigabit per second and beyond, along with low latency and other potential benefits. In the U.S., Verizon, AT&T and T-Mobile are all chasing their own 5G future—and each other. Apple indicates that it plans to test 5G technologies in two locations in controlled facilities, one in Cupertino and another in Milpitas, California. Apple said that it plans to use the 28 and 39 GHz bands via technology provided by Rohde & Schwarz, A.H. Systems and Analog Devices. Apple Inc. seeks to assess cellular link performance in direct path and multipath environments between base station transmitters and receivers using this spectrum…These assessments will provide engineering data relevant to the operation of devices on wireless carriers’ future 5G networks. The transmitting equipment Apple intends to use is incapable of station identification. Because Apple will coordinate its operations with existing microwave users in the area, Apple respectfully requests that the Commission exempt this authorization from the station identification requirements. Light Reading earlier reported Apple to be hiring at least one engineer with knowledge and experience of “radar signal processing,” which implies the signals which are used in millimeter wave transmissions. Millimeter wave is the band of spectrum between 30 GHz and 300 GHz. 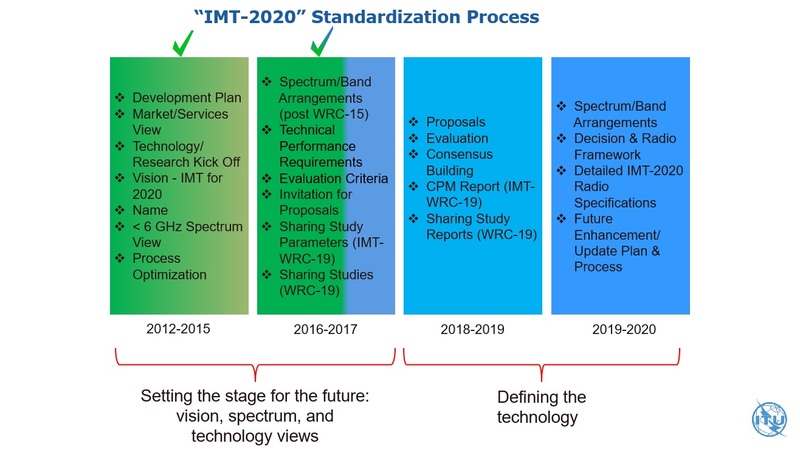 The ITU-R WP 5D/IMT 2020 standards committee has proposed 30 GHz to 86 GHz for use by 5G networks (see below). “5G” Carrier Specific vs ITU-R IMT 2020 Standard? Since Apple’s application notes that it “will conduct its experiments for a period not to exceed 12 months.” Consequently, it stands to reason that the 2019 iPhone 9 will be the first iPhone with “5G” connectivity. But what version of “5G” will that be? A few months ago, AT&T and Verizon said that they will begin rolling out their own (non standard, carrier specific) 5G networks late this year and in 2018. That’s before ITU-R WP 5D/IMT2020 standards committee will decide on the Radio Access Network (RAN) to be used for true 5G. End point devices made for AT&T’s “5G” network won’t work on Verizon’s and vice-versa. Apple (and other smart phone/tablet makers) will likely delay the release of a volume production 5G iPhone until overall 5G coverage becomes widespread. ZTE has signed strategic partnerships on 5G development with the world’s top telecommunications carriers including Deutsche Telekom, Telefonica, SoftBank, KT Group, China Mobile, China Telecom and China Unicom. In 2014, the FCC published a Notice of Inquiry into use of spectrum bands above 24 GHz for Mobile Radio Services, 80 followed by a Notice of Proposed Rulemaking in October 2015, which listed the following potential bands for 5G in the United States. The FCC issued adopted rules to identify and open up 5G spectrum allocation in July 2016 that identify 3.85 GHz of licensed spectrum and 7 GHz of unlicensed spectrum: licensed use in 28 GHz, 37 GHz, and 39 GHz bands; unlicensed use in 64-71 GHz; and shared access in the 37-37.6 GHz band. This entry was posted in 5G, IMT 2020 standard, iPhone, Uncategorized. Bookmark the permalink. Forrester Research: IoT Upsets Application Development- Hello Streaming & Machine Learning! Apple’s venture in exploring newer broadband technologies has been rumored off and on. Alan Weissberger’s blog post clearly shows that Apple might just be on to something serious! Technical details on Apple trials are a bit sketchy. Let us hope Apple’s efforts lead to more competition in the ISP/broadband services space.